I always learn something and usually quite a few things on our trips. 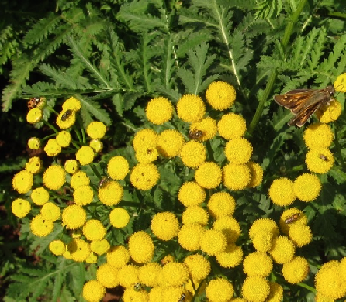 I have always thought of tansy as an interesting and good looking plant, but I hadn't realized what an insect attracter it was until seeing these plants in the vegetable gardens of Monticello. The plants were loaded with beneficials, pollinators and some pests as well. I think we should include this perennial more in our gardens. Here's more detailed information about tansy from the Dirt Doctor Library and links to the other interest points on our recent trip. Products for pest control, lawn and garden care are available in independent garden retailers that stock organic products and online at the Natural Organic Warehouse (NOW).